Kirkman started his career as an amateur with Burnley in 1937, signing professional forms for them in September 1939. Unfortunately it was not until he was aged 26 that he made his league debut for Rochdale whom he had signed for September 1946, the Second World War having put a hold on his career. He them moved to Chesterfield for £4,500 in December 1947 and onto Leicester City in August 1949 who paid an £8,500 fee for the player. Kirkman moved to Southampton in July;y 1950 and then joined Exeter City as player manager in March 1952, with Grecians boss, George Roughton, moving in the opposite direction to become the manage of the Saints. Kirkham made his Grecians debut against in a 3-0 home defeat against Northampton Town in March 1952, and played din a total of 8 league matched that season. He added a further three appearances the following season, but in march 1953 left St James’ Park to become manager of Bradford Park Avenue, where the lure of a four-figure salary proved to be too tempting to turn down. 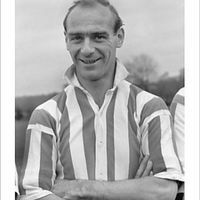 Kirkman remained with Park Avenue until January 1955, however by July 1958 he was working for a frozen food company in Sutton Coldfield, combining that with scouting in the North of England for Southampton. He later had a spell as manager of Northwich Victoria, being appointed in June 1965, but he left only four months later. Kirkman died in 1995.